Cancer You start the month with new courage. Polish your image and come out from behind that mask. Believe that your confidence and charisma will win people over and it will. Gloomy mood will come every now and then but it's beneficial to be positive always. If stuck in a different decision, go your own way. Choose quality and stick to your own way of thinking. If you're in a relationship, compromise is a very important ingredient. Only when you are completely yourself and believe in yourself that you will be able to build up a balanced and healthy relationship. If you're single, be careful not to lead someone on, or give off confusing signals yourself. Cancer A wonderful month awaits you, Cancer. There will be some minor setbacks in the beginning of the month but it's nothing that you can't handle. When you put all your desires and aspirations in the center, all things will work out in the end. Your relationship is going smoothly and you and your partner are on the same page this month. It could be because of the holiday season or that you have grown mature enough to ignore minor irritating tics and the forgive small mistakes from the recent past. This is an opportunity to balance your relationships if they've been tilted for a while. Do something grand and be generous with love and small attentions. 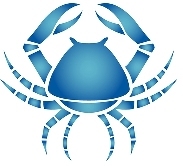 Find out about the Cancer love horoscope and famous Cancer people using the link above.